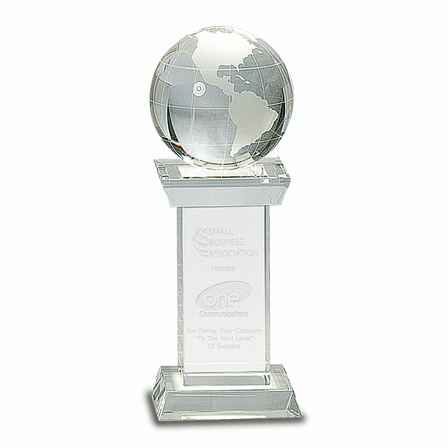 FEATURES/SPECS When your award recipient or winner gets to hold this globe award for his or her finest achievement, they are going to be thrilled with its beauty and elegance, and will proudly display it on their desk at work, or at home on the shelf or mantle for everyone to see. 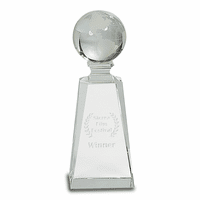 The eye-catching clear crystal globe with etched Earth-detailed continents and latitude/longitude lines sits atop an elegant crystal Romanesque pedestal. 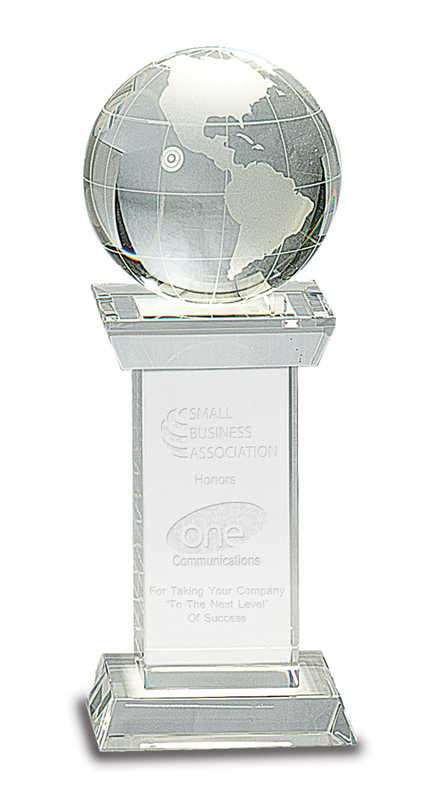 The pedestal is the perfect place to engrave a message of appreciation for your world-class employee, the name of your stellar sports team, or an acknowledgment of your awardee's committed efforts to improve their community or the planet in some amazing way! 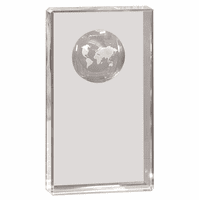 We ship the award packaged in an attractive gift box that is ready for your award ceremony, so you are all ready to present it to a very special person! Of course, at the Executive Gift Shoppe, you always have our Satisfaction and Performance Guarantee! 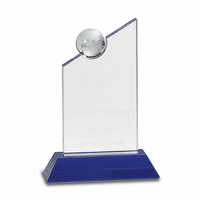 I am interested in having both sides of the award personalized. On the back side, I'd like to have Logo 1 added, so that it shows through as a Silhouette effect with text personalizing the front. 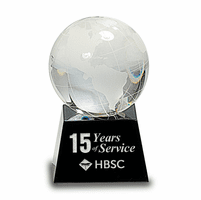 Can I also engrave on the base of the award? We can definitely engrave using a silhouette effect. We would engrave the back, as you mentioned, so it shows through to the front. We would not be able to engrave the base though, it is on an angle that will make it impossible for our laser engraving machine to reach it and engrave it cleanly.